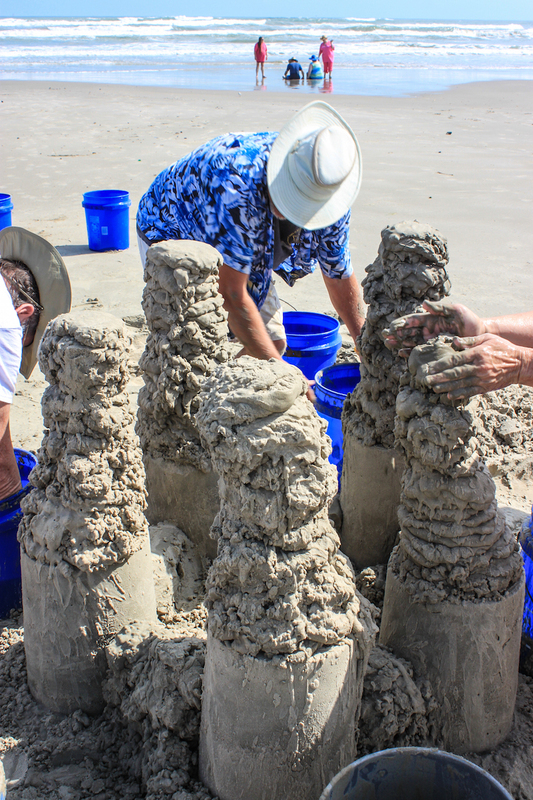 Texas SandFest APRIL 26-28 in Port Aransas -- Amateurs Welcome! In preparation for the annual Texas SandFest in Port Aransas, this intrepid reporter took a lesson in sand sculpting from The Sandcastle Man. 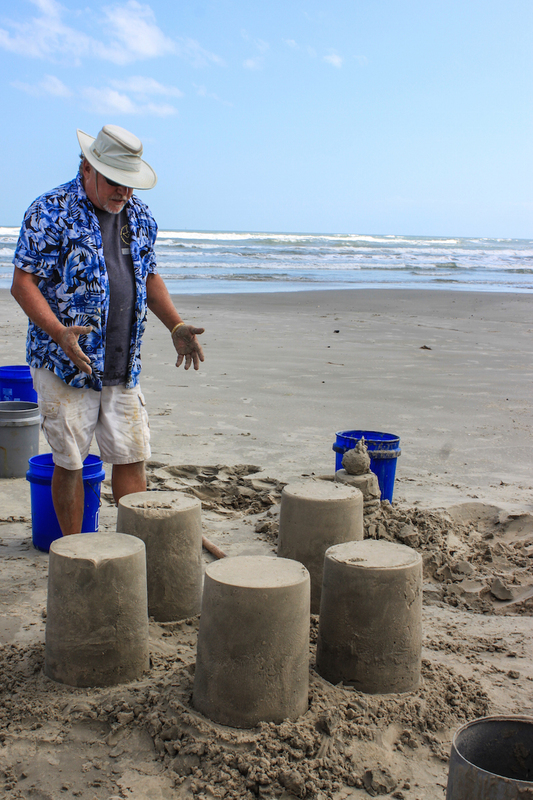 Mark Landrum has been building sandcastles professionally for 16 years. 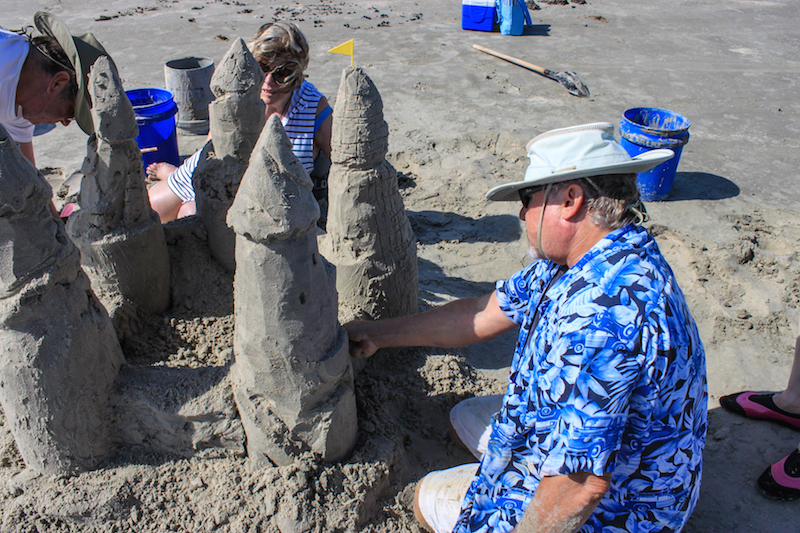 He's taught the art and craft of sandcastle building full time for the past 10 years. "I was awarded 'Most Unusual Profession' at my latest high school reunion," Landrum said with a grin. "It's more than just a hobby for me, it's a way of life." 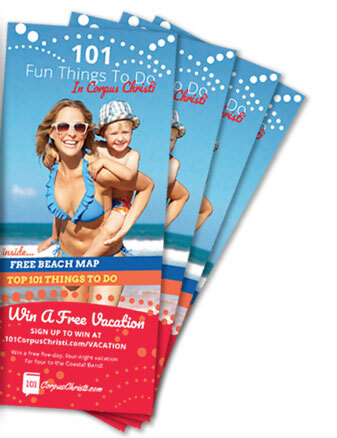 SandFest attracts more than 100,000 sand fans to Mustang Beach each year. 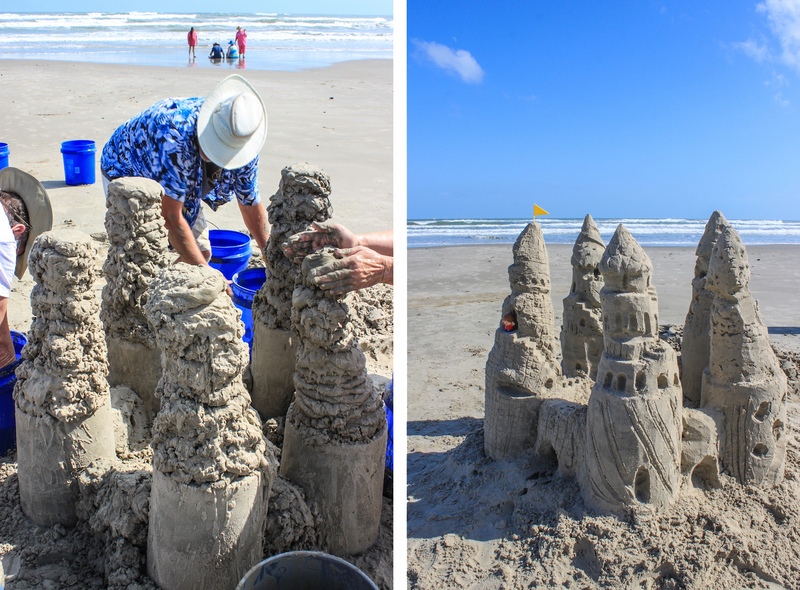 Artisans of sand come year-round because of the world renowned Coastal Bend sand. The grains are fine and flat and retain surface tension that helps artistic creations stick together like glue. And then, there is the real glue that is added to water and sprayed on the sand to keep its lines and angles sharp, but more on that latter. An engaging and hands-on instructor of all things sandy, Landrum’s friendly manner and sly sense of humor can turn any amateur artist into a capable craftsman. Building sandcastles is all about having fun and letting your inner sea spirit soar.. Dig a shallow hole in the beach, moving the sand to where you want your castle. Pile the sand haphazardly, letting it slide off the shovel in one piece. It should break apart into large chunks, resembling a rocky pile. Claw at the top of the rocky pile to make a wide and shallow crater. Use your fingers to poke holes through to the bottom, making room for water. Fill the crater with a bit of water, then use your hands to turn over the sand and pat it down until it forms a flat, solid base. Lightly set the bottomless bucket on top of your base (don’t press it into the sand). First put a small amount of sand in the bucket and pour a tiny amount of water. Use your hands to press the sand into the bottom and against the sides. This cements the bucket to the sand, creating a plug so that water can’t leak out. Once your plug is leak-proof, quickly alternate shoveling sand and pouring water into the the bucket until it is full. Wipe the top in a quick windshield-wiper motion and the pat the sand down. Once all the water soaks in, pull the bucket straight up. Fill your other bucket a quarter of the way with water. Then fill with sand to the top. Make pancakes by scooping the sand with both hands out of the bucket and plopping the handful on top of your tower. Spread it across the top and pat it a few times until it is flat. It should spread easily. If it feels like you’re spreading peanut butter, your sand is too dry. This process is called “form stacking” and is the trickiest step. It takes practice, so don’t get discouraged. Make your tower nice and tall. Connect the towers by making walls: scoop a handful of sand from your bucket and form into the shape of a brick. Hollow out the walls to make an arch. Use plastic cutlery to create stairs, ledges, balconies, windows and more. Add little details to make your castle one of a kind! Once you’ve got the hang of it you can register at texassandfest.org to compete in the amateur class. I think I’ll go watch the masters at work instead. For a sneak preview, check out Landrum’s work — or sign up to take a lesson with him — by visiting his website at www.sandrum.com.